When was the last time you stepped into a bar and left smelling like an ashtray? The last time you saw a half-wall dividing smoking and non-smoking areas inside a restaurant? How about the last time you saw the haze of cigarette smoke lingering over a bowling alley? For someone living in Kansas, the answer is probably at least five years ago. For me, it was last week. I relocated to Ho Chi Minh City, Vietnam, in July, and smoking here is prevalent. My husband and I took our kids to bowl, and we ended up leaving before we started playing because the smoke was so thick I thought my contacts might curl up and fall off my eyes. Smoking is a common social activity here, and it’s not seen as disruptive in enclosed spaces. A couple of weeks ago, I went to a small theatrical production situated in the back room of a narrow tapas bar. While we waited to take our seats, several people casually lit up in a crowded room, exposing about 30 people to their second-hand smoke. That’s not to say there aren’t restrictions on smoking; it’s just very lax. 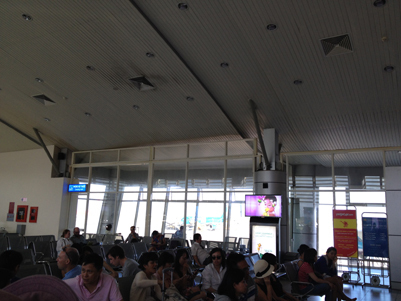 While waiting for our flight out of Nha Trang, Vietnam, I observed people using the designated smoking area. Well, the attempt at building a smoking area seems to be what counts more than anything. The glass walls that enclosed the space did not extend fully to the ceiling, and the door had a 2-inch gap at the bottom. Thus, the entire gate smelled of cigarette smoke. 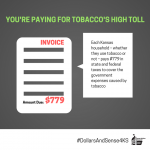 There’s also no age restriction for purchasing tobacco products. Just this morning, I watched a teen light up a cigarette while she hopped on a motorbike taxi that took her school. It is amazing how quickly we can adjust to new norms. In Kansas, the 2010 Indoor Clean Air Act was passed to prohibit smoking in various indoor and outdoor public spaces, and well, that was that for smoking in public. Our expectation as Kansans now defaults to a smoke-free environment. That’s definitely not the case in my new home, and it leaves me feeling hypersensitive to the smell and almost laughably puritanical when I encounter smokers in my air space. Vietnam is a far cry from Kansas, obviously. The World Health Organization’s 2010 Global Adult Tobacco Survey listed 47.4 percent of all Vietnamese men smoke tobacco in some form. With 8 million people living in Ho Chi Minh City alone, that’s a fair amount of smokers. Even attempts to educate about the harmful effects of tobacco, like the large, graphic images placed on packaging, are clearly not an effective deterrent. Smoke-free and clean air advocates, along with funders like Health Forward who support such efforts, are to be commended for the effective and relatively quick work of getting strong regulations in place. The next time you are in a public space free from smoke, take a deep breath and offer a silent thanks to the clean air advocates who worked for that change.